Let's see now. Driving down West Broadway, it's always nice to take a look at the restaurants and figure out which one to hit next. 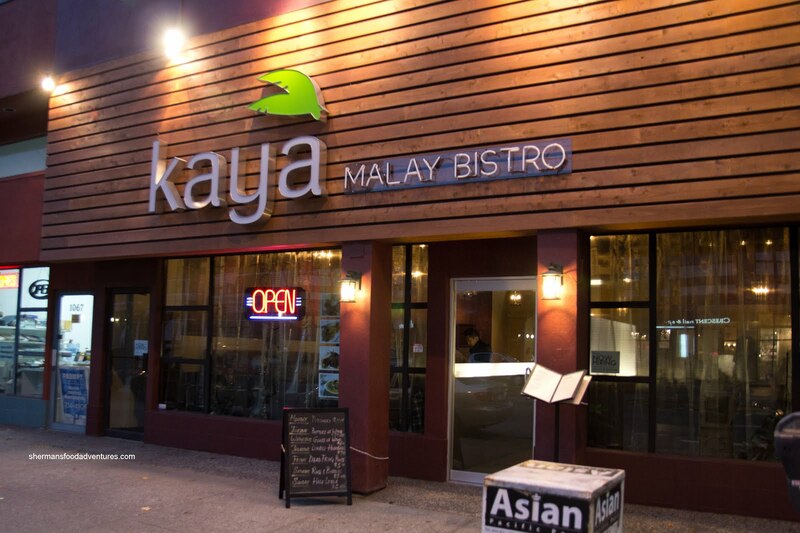 Okay, Lin - done that; Boston Pizza - ew; Maurya - okay someday; Tojo's - wow, can't believe it was that expensive; Kaya Malay Bistro - hmm, that's new; Red Robin - gone; woah wait. Let's rewind here. 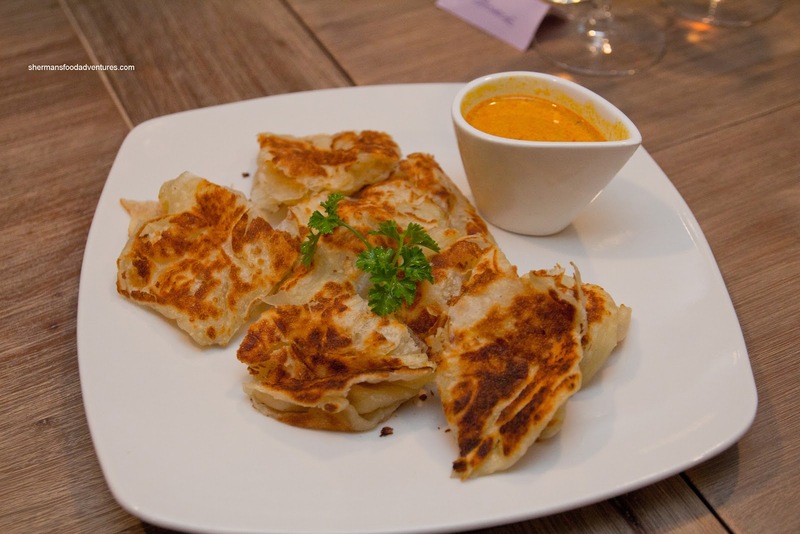 A new Malay restaurant? Okay, I really want to try that. Well, time passed and I didn't have a chance to head in that direction (after all, softball season is over). But wait, what's that in my email? An invite from Stephanie to try it out? Oh how convenient! 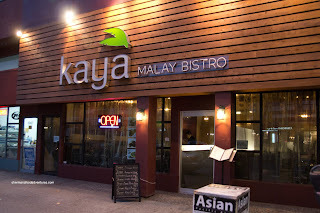 Really, it's always nice to see more South Asian restaurants in Vancouver because frankly, there aren't enough. The invited dinner was quite the event as there were over 25 guests in the upstairs dining room. We were served a special menu which included Malay classics as well as some interesting fusion offerings. 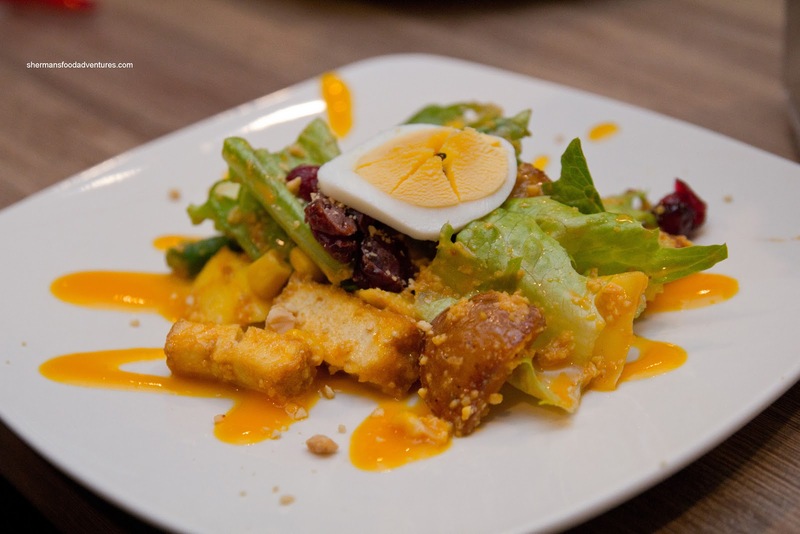 We started with the Kaya Salad consisting of romaine lettuce, corn, dried cranberries, boiled egg, potatoes and deep-fried tofu with a creamy mango and peanut butter dressing. For me, I found the salad to be on the sweeter side in need of some acidity and possibly salt. The mango got a little lost and there was far too much dressing where the ingredients got drenched. Due to the high level of sweetness, the cranberries were somewhat of an overkill. 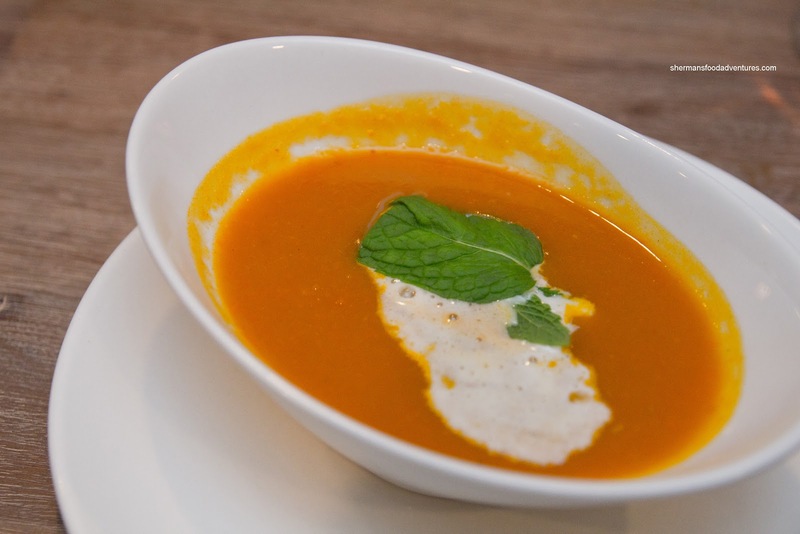 Next up was the Squash & Apple Curry Bisque served with Home-style Roti. I liked the bisque as it had a nice kick with a good balance of savoury and sweet elements. The texture of the soup wasn't exactly smooth, but I didn't mind it as it wasn't chunky either. As for the roti, it was on the denser side, but it was cooked up nicely on the outside, where it was quite crunchy (possibly too crunchy?). The curry dip was thick and had a real nice spice level. It was nice compliment to the roti. Moving along, we got a bonus item of sorts, as it wasn't on our original menu. 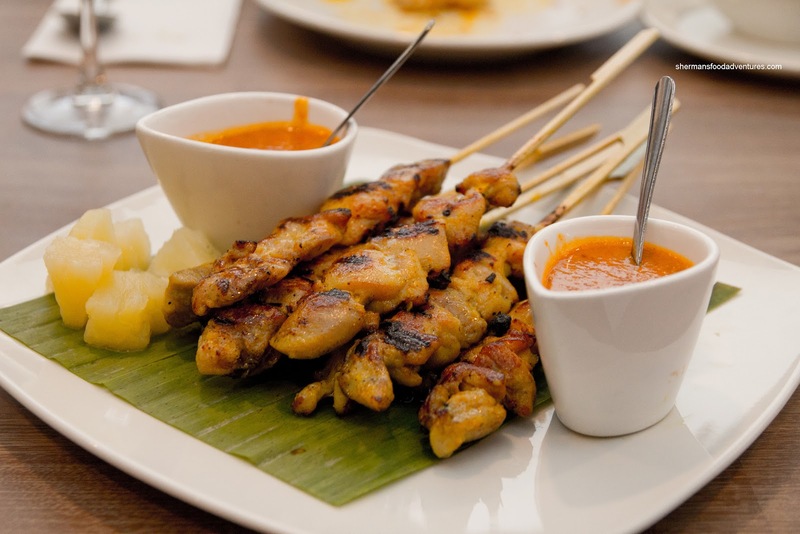 The Chicken Satay was really tender and was asthetically pleasing. There was good charring on the outside which added to the inherently pleasing flavour (from the marinade). The dip was equally good being sweet and peanutty. 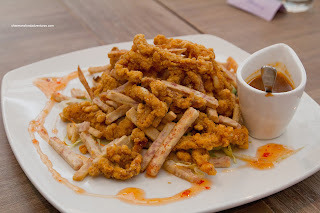 Arriving on a large sharing place was the Crispy Spicy Calamari with Taro Root. At first glance, it looked more like fried clam strips and matchstick fries, but it was nothing but. The calamari was crispy just as its namesake. Too bad it was cold, due to the large quantities that needed to be made for our large group. I'm sure it would be served hot on a more typical basis. The squid itself was fairly tender while the tamarind chili sauce added zing and sweetness. The thin taro fries were crispy where I couldn't stop snacking on them. 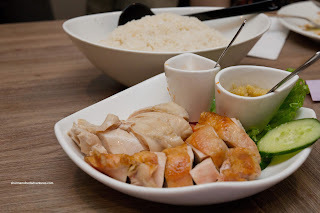 The every-so-familiar Hainanese Chicken showed up next sporting 2 different versions. One was the regular poached type and the other was roasted. I found the chicken to moist and tender with the requisite gelatin underneath the skin. The accompanying grated ginger condiment was very good. It was of course gingery, yet not in a harsh way. Naturally, the dish was accompanied by chicken oil rice which was slightly moist. It was flavourful with hits of ginger and aromatic oil (where there could've been more of it though). 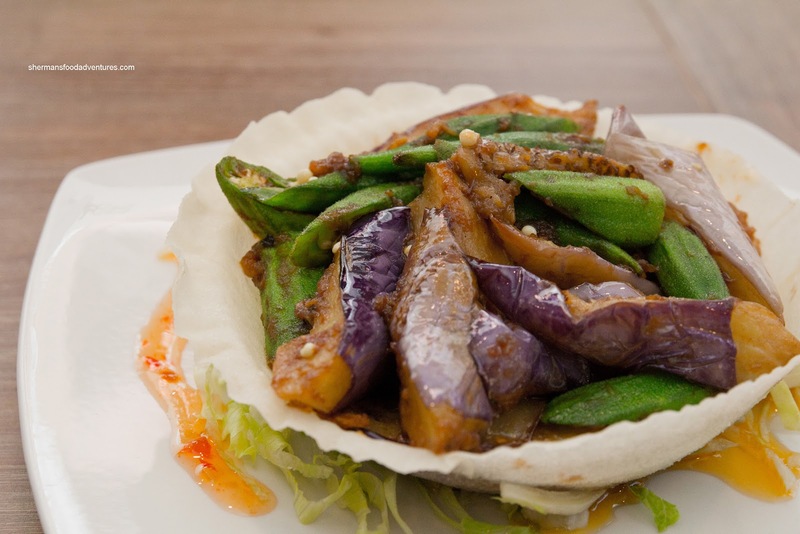 Heading towards the end of the meal, we got our first vegetable dish being the Wok-Fried Eggplant and Okra. Now, if you've ever had okra before, you would be familiar with its slimy texture. In this case, they did a pretty good job as it was more firm than slimy. The eggplant was slightly soft, yet not mushy either. 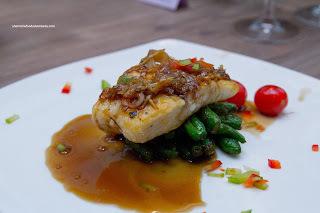 The dish exhibited good wok heat and caramelization. The spicy shrimp paste added good aromatics and flavour (and had an "XO" sauce type effect). One would think this would be the cue for dessert, but no way, we had 2 more meat dishes! The first one was Pan-Fried Halibut with sauteed green beans. Sadly, the halibut was way overcooked and dry. However, the shallot, garlic and ginger sauce was sweet and tasty. 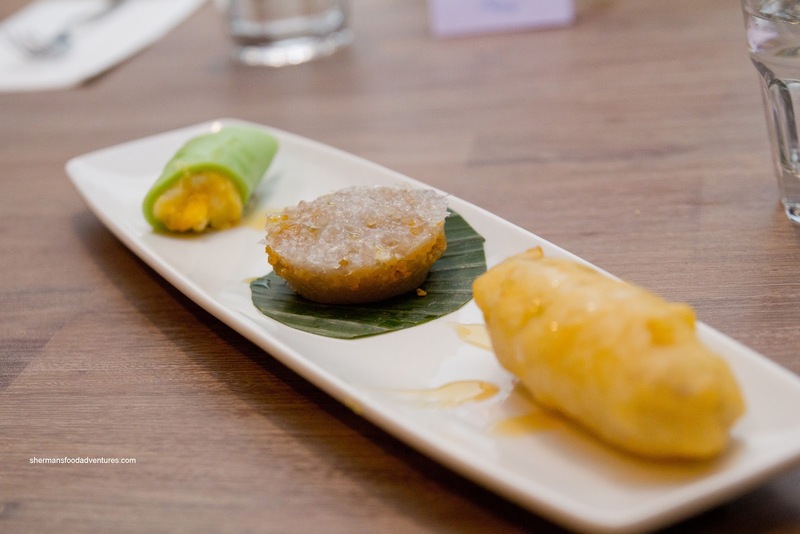 The beans were the star of the plate as they were crunchy and laced with chilis and palm sugar. Our last savoury dish was the Grilled Rack of Lamb with yam mash. 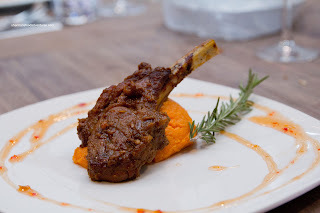 The lamb was super moist and tender. I personally would've preferred it to be more rare, but since it was tender anyways, it wasn't important. The curry and ginger rub had depth and plenty of impact. The yam mash was naturally sweet and smooth.